With the exception of winter sports, you can find every made of sport in Rio, from golfing to hang-gliding, from kite-surfing to cart racing.You are welcome to join them for a variety of extreme sports if you love the adrenaline rush. Most sporting activity takes place around the South and West Zones of Rio. You have a choice of paragliding, river rafting, rock climbing and climbing up Sugarloaf and Corcovado. Your dream of flying is closer than you imagine. 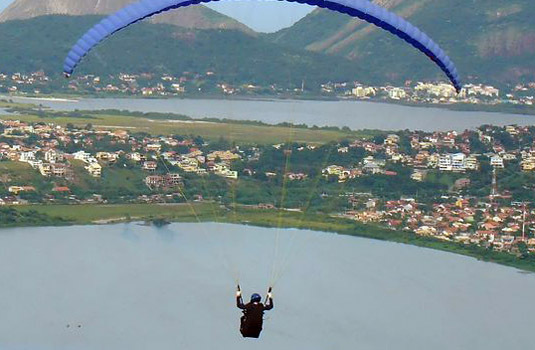 You can hang glide or para-glide over the city and land on a beach.The Sao Conrado neighborhood on Pepino Beach, south of Rio is the place for paragliding and hang gliding. There is a ramp close to Pedra Bonita within the Tijuca National Park. Each flight lasts around half an hour to 45 minutes, depending on the weather conditions. Regardless of the weather, you should call as soon as you arrive and ask to be on stand by, as the favorable wind conditions have little to do with how sunny it is. No training or special gear needed (other than sports-shoes, no sandals). Rio’s natural landscape is ideal for climbing, which is another popular sport in the city. 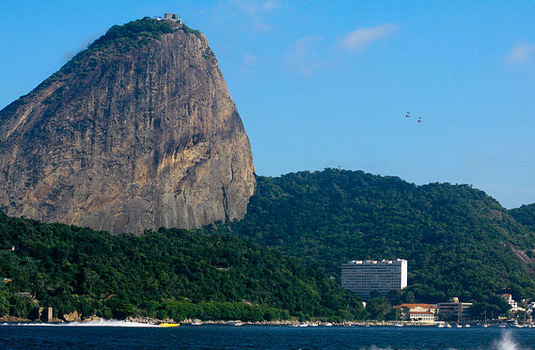 The mountain formations offer excellent climbing routes which include Sugarloaf Mountain and Corcovado, among others. Professional climbers from all over the world flock to Rio since there are plenty of rock peaks. Rock climbing and mountaineering tours are available to everyone moderately fit.Even if you never climbed before the safety harnesses, ropes and helmets help guarantee you go back home in one piece. Depending on the your level of expertise you will find a range of climbing packages including boulder climbing, wall climbing and rock climbing. Some of these are combined in hiking or trekking camp to Sugarloaf Mountain or Corcovado. Sugarloaf is a favorite climbing spot with the Classic Line on the western side of the mountain being a popular route with grades from 5.4 to 5.13a and from 2 to 12 pitches long. Corcovado Mountain also has climbing routes up to level A4, which includes K2.